The March numbers are in and everyone from the Seattle Times to the NWMLS is putting their spin on them, proving that figures lie and liars figure. Here’s my take on what’s really going on. Across King County, the first quarter ended with about double the inventory we had at the same time last year. While this sounds impressive, depending on where you live, the increase was from about a half a month of available inventory a year ago to about 1.2 months today, which historically is still really meager supply. And keep in mind that it takes four to six months of inventory to be considered a balanced market. We had a taste of what a balanced market feels like during the second half of 2018, but in many popular neighborhoods things have swung back in favor of sellers at most price points. Finally, even after last year’s slow second half, prices across the area are flat to down just a few ticks vs. a year ago. Not all sellers have accepted this reality, but as a buyer there are opportunities out there and deals to be made. The numbers are instructive, but for a better look at what’s really going on, you should look at real examples of available properties in popular neighborhoods like Bellevue, Kirkland and Madison Park. It’s easy to find nice homes in great spots that have been on the market long enough that they might entertain offers below the asking prices. Just say the word and I’ll send you some examples. I’d also be happy to provide you with an analysis of what your current home is worth in today’s market. You may be pleasantly surprised! By all accounts, our high-flying real estate market cooled a bit during the second half of 2018. Buyers took a hiatus, fed up after years fighting a heavily tilted seller’s market. As a result, homes at all price points took longer to sell, driving inventory higher and prices lower. The good news is that depending on your specific neighborhood, despite the grim reports of rapidly falling prices and coming market crashes, your property’s value probably finished the year about even with where it was a year ago. Across the Eastside, the median price of a single family home in December 2018 was down 3% vs. a year earlier. For Seattle the median price was up 2% for the year. As we work our way through January, the anecdotal “evidence” indicates that the real estate market is emerging from its 6-month funk. (That’s a technical real estate term!) Working with both buyers and sellers since the first of the year, I’ve noticed increased activity and pace in the market. Buyers are returning and writing offers and new listings are hitting the market, which increases buyer interest and contributes to the improving cycle. In just the past two weeks I have encountered a couple of multiple offer situations and more recently I’ve come across two new listings with “offer review dates”. Neither of these scenarios were common during the second half of 2018. I don’t like to make sweeping predictions…but maybe just this once. I think we’re heading for an active spring that will feel more like a healthy, balanced market than anything we have seen in years. There will be enough inventory to give buyers a choice of homes to visit and bid on, without the steep price appreciation or the crazy bidding wars of the past few years. The market is smart, however, and will remain very efficient. This year both buyers and sellers will have to be on their games. The latest market data bears out the fact that the local real estate market is taking a bit of a “breather”. After becoming accustomed to the booming seller’s market of the past few years, the fact is that now is the best time in the past 5 years to be a buyer! Here’s why. According to the latest MLS data, inventory levels for October across our area were roughly double what they were a year ago. According to the stats, West Bellevue has actually left “seller’s market” status and is now behaving like a “balanced market”. I do believe that the underlying fundamentals of our market point to better times ahead for sellers, but if you’re a buyer in the current environment there are great properties out there to look at right now. Since much of the increase in inventory is due to homes staying on the market longer, in many cases buyers are able to negotiate off the asking price. Much of the current market adjustment is being fueled by lower demand, meaning that there are just fewer buyers out there looking at and competing for listed properties. The result is a more “normal” negotiation process and less frenzied transaction pace for buyers. On average, the houses that sold in October 2018 across King County took 33 days to sell. A year ago that number was 23 days. That’s a 43% increase in time on market and believe me, you can feel it! In addition, mortgage lenders have been working hard over the past few years to come up with programs to help their clients to look more like cash buyers when competing for properties. Many of these programs also work for buyers who would prefer to buy their new home before selling their current one. I can introduce you to some good lenders if you are interested. Whether you are buying, selling or just pondering future possibilities, in a shifting market like this it is more important than ever to understand the dynamics of the market and to get all your options on the table. Give me a call if you’d like to talk. A quick conversation is almost always worth the time, especially if I buy the coffee. Much has been said and written lately about the changes taking place in our local real estate market. For the data junkies among us, here is a good article from the Seattle Times with all the stats. For those of you with less time on your hands, here are my Cliff Notes on the current state of affairs. •	Single family home prices both in Seattle and on the Eastside have dipped a bit since hitting their peak in May. Depending on your exact neighborhood, prices are probably down about 5%. •	More importantly, through September, prices across the region are still up vs. a year ago. Again, depending on your location the Eastside is up approximately 4% and Seattle is up about 7%. All in, I don’t think this summer’s lull represents a fundamental change in the upward trajectory of our market. •	We are still in a seller’s market, but the balance of power has shifted in the direction of buyers in recent months. Inventory is increasing not due to an influx of new listings, but because homes are sitting on the market longer. The upshot of these market adjustments is that it feels a lot more like a “normal” market out there than it has in a long time. Buyers are taking their time and being more discerning and sellers are having to adjust to a new reality. Here are a few examples of how things have changed. In many cases buyers can now actually negotiate the purchase price of a home! Offer review dates, which were a fixture during the over-heated market of the past few years, are largely a thing of the past. Bidding wars are much less frequent and fewer houses are selling for more than their listing prices. Buyers can go take a second look at a house before making an offer, and then offer less than the asking price. I’m not making this stuff up! Buyers are also including critical contingencies in their offers. In the go-go market of the past few years buyers were forced to take on undue risk by waiving contingencies in order to present “clean” offers and win bidding wars. This is no longer the case. All of my recent transactions, representing both buyers and sellers, have included inspection contingencies. These give buyers the peace of mind of being able to renegotiate or get out of a deal without penalty if the inspection turns up something they don’t like. Sellers have to adjust their expectations and remind themselves that this, and not the wild ride of the past few years, is the normal course of business. Financing contingencies, which were taboo during the recent binge, are also back in play. Not everyone has the money sitting in a Swiss bank account to pay cash for a house, and in today’s market qualified buyers can finance their purchases without waiving their rights or doing other painful financial contortions in order to make a deal. Good lenders have also become more creative and lots of deals are coming together that include a variety of clever financing options. Sellers should rely on their listing agents to differentiate between high-risk and low/no-risk financing (and buyers) in the offers they are evaluating. As long as you can be sure that the money shows up at closing it really doesn’t matter where the buyer is getting it. Perhaps best of all, in the right situation buyers can once again buy a home contingent on the sale of their current home. We haven’t seen these deals in years and I’ve recently negotiated two of them, one for a buyer and one for a seller. These transactions require a bit of finessing, and like the financing nuances above, a good agent can be very helpful in navigating the process. The fact that contingent sales are back is really a sign of the times! In general, sellers have to be realistic when pricing their homes. Most buyers know the market and are not likely to pay your asking price just because you asked it. Properly priced and marketed properties are still selling but it’s important to do the research up front so you are acting on solid data. This is not the market for trying “shoot the moon” prices. Savvy buyers are also less likely in the current environment to overlook imperfections and deferred maintenance. With more homes to look at, buyers will be comparing you to the competition. So finish the projects, do the work that needs to be done, and put yourself in the best possible position to sell your home quickly and for top dollar. 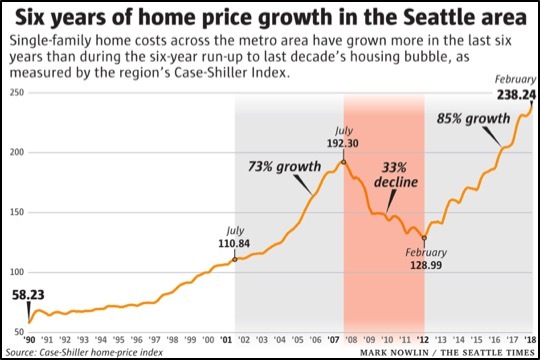 The graphic below details the trajectory of Seattle area home prices since 1990 –seemingly all good news for sellers. Note that February (the last month for which Case-Shiller has published numbers) marked 6 consecutive years of rising prices, matching the length of the last run up, but far outpacing its price increases. Matthew Gardner, Windermere’s Chief Economist, sees the trend line continuing, driven primarily by population and job growth. (See Matthew’s latest analysis HERE.) Add our continuing inventory shortage to the mix and it remains the best time in history to sell a home in our area. On the flip side, first time buyers, downsizers and move up buyers all face challenges in this market and creativity continues to be the coin of the realm to be successful as a buyer. Complicating factors for buyers include fierce competition for available homes, mortgage rates at 8-year highs (and climbing) and the fact that many potential buyers want to purchase their new places before selling their current homes. My friend Lysa Catlin and her team at Caliber Home Loans have some interesting workarounds that might be helpful. Here are a few. Full TBD (property To Be Determined) Underwriting Approval. Getting through the full underwriting process BEFORE MAKING AN OFFER allows buyers to provide much stronger pre-approval credentials with their offers and to close within 15 days of offer acceptance. Many are waiving their financing contingencies, which makes an offer as good as cash! The Lock and Shop program allows you to lock in today’s interest rates with 30 days to identify a property to buy and 45 additional days to close on the new home. Bridge Loans for up to 75% of the value of your current home can be used to purchase a new home and then be converted to a traditional loan after the current home is sold. The Departing Residence Program lets you qualify for two mortgage payments by allowing you to count market rent on your current home toward your qualifying income – without having to rent it out. A Home Equity Line of Credit on your current home can be used for a down payment. Lots of food for thought. Call anytime to talk about your specific situation and all your options. When you’re finished untangling lights on the roof and sampling that new eggnog recipe, this can be a great time of year to think about getting organized for what’s ahead. Here are a few thoughts if a real estate transaction could be in your 2018 plans. 1. Tackle a project or two that you have been avoiding. Roof covered with moss? Driveway cracked and worn? Paint looking a little tired? This is a good time of year to talk to contractors. You can and idea of budgets and you may be able to use flexibility on timing to your advantage. 2. Discuss your financial options with an expert. Especially given the changing tax landscape, understanding all the financial ramifications of a transaction might cause you to consider alternative funding or financing options or open up completely new possibilities. 4. Take a drive. Whether you are thinking about moving to a new area or looking for something right in your neighborhood, go take a look around. WALK around somewhere you haven’t walked before and go to some open houses on a Saturday or Sunday. You’ll be surprised by what you learn about neighborhoods, housing options and even the neighbors! 5. Finally, give me a call (duh)! No matter where you are in the process a quick conversation to get all the options on the table and at least figure out what your current home is REALLY worth is always worth the time. (Hint: It’s probably not what Zillow says ) I can also give you some friendly advice on what to do – and not do – to get your place ready to sell and I’ve got resources to help you get started on any of the tasks above. No matter what you’re doing, I hope you have a chance to slow down a bit and enjoy a joyous holiday season with friends and family. Some have suggested that our local real estate may be cooling a bit, but I don’t see it. In fact, the normal seasonal swings in market activity seem to have blended into one continuous selling season with just a few notable slowdowns — like Christmas Day and the Fourth of July! So, it’s full steam ahead, including this time of year, which normally brings increased activity and additional listings to the market. As part of my ongoing effort to educate and inform the ever-expanding “considering a move” crowd, I’d be happy to show you available and recently sold listings in popular neighborhoods of Seattle, Kirkland and Bellevue. (Don’t worry if your dream home just sold. Where there is one, there are more and I know how to find them!) Whether you are looking for a condo where you can lock the door and leave town without a worry, or you prefer a single family home in new neighborhood, seeing some listings and/or visiting some properties will serve as food for thought for the downsizer in all of us! As many predicted, the spring real estate market is heating up and things are starting to look an awful lot like last year. The market remains heavily tilted in favor of sellers, and multiple offers and quick sales are the norm in many price points. I continue to get lots of “where would I go” questions from folks thinking about selling their homes and considering their next moves. The most popular destinations seem to be Kirkland, downtown Bellevue and a few neighborhoods in Seattle. An increasing number of people are also thinking about selling, taking some money off the table and renting for a year or so while pondering their next move. This is an attractive financial model for lots of folks, and it also removes the timing pressure. There are plenty of good options out there. You just have to know where to look and how to dig for them. Let me know if I can help. And should you decide to make a move have no fear, none of my clients have been left “homeless” yet! Home prices continue on their upward trajectory across our area (September prices were up 10.3% vs. a year ago both in Seattle and on the Eastside.) and the inventory picture remains tilted in favor of sellers. But subtle changes are afoot, creating interesting opportunities for clever buyers looking to make a move. I’ve waited until mid-October to say it, but it’s now clear that after the feeding frenzy of last spring and early summer the market’s normal summer slowdown is bleeding into fall. ** Buy first. Take advantage of the market’s fluctuations and buy your next home now while things are a bit quieter. Then sell your current place after the first of the year when things heat back up. (Yes, I think they will.) I can introduce you to resources who will provide you with a financial “bridge” to the sale of your current home, if needed. This scenario allows you to avoid the stress of the classic “nowhere to go” scenario, and may also be less expensive than leasing an interim home. You will only have to move once and would have time to make some repairs or upgrades to your new place before moving in. ** Find the road less traveled. Work with someone who knows the market and can identify and negotiate with the motivated sellers. There are properties that have been on the market for a while or are no longer listed that just need the right offer to trigger a deal. Don’t waste time and raise your blood pressure in competitive situations that don’t make sense for you or trying to educate less than reasonable sellers. Life is too short!